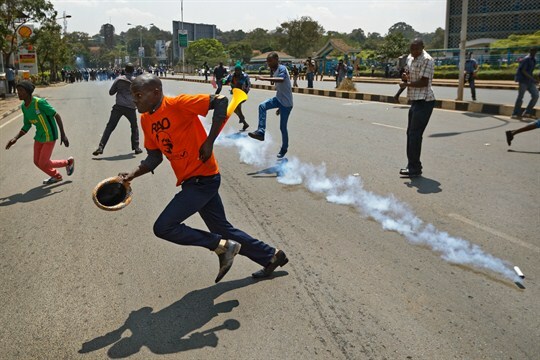 Opposition protesters scatter as police fire tear gas at them during a demonstration in downtown Nairobi, Kenya, Sept. 26, 2017 (AP photo by Ben Curtis). Kenya’s long-running political drama is sinking deeper into crisis, testing the outermost limits of the country’s election laws. Its highest court seemed at first to have struck a rare victory for judicial independence with its declaration that August’s presidential election, which gave a second term to President Uhuru Kenyatta, was “invalid, null and void,” necessitating a rerun. But as the weeks have passed, the Supreme Court ruling looks more like a mixed blessing that guaranteed a prolonged political morass.